Fits approx. 1 inch small, if in doubt size up. Checked by staff in-store! 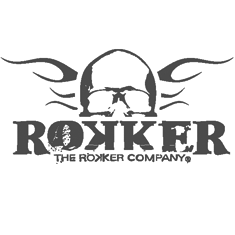 Rokker of Switzerland are working with Scholler a high tech materials company to bring us some of the most technical and stylish motorcycle jeans on the market. Quality costs money but you get what you pay for! Integrated c_change™ membrane. This membrane reacts independently to changing temperatures and activities and is 100% waterproof and windproof. It closes when exposed to cold and opens in response to warmth, the prevailing humidity and body moisture are taken into account in this process. In doing so, not only temperature but also air and body moisture are balanced out. c_change™ ensures the ideal body climate. Included removable d3o-protectors. The d3o™ CE certified protectors provide maximum comfort through softness and flexibility, but when impacted at high speeds d3o™ displays excellent shock absorption as the intelligent molecules inside lock together, spreading the force over the whole pad and offering so an excellent protection. Sizing for the Rokker Revolution Jeans as verified by the Urban Rider team. Take your favourite trousers, lay them flat and compare them to our measurements of the Rokker Revolution Jeans below.